New technology to provide detailed scans of patients could improve the recovery of people suffering with liver cancer, scientists have said. 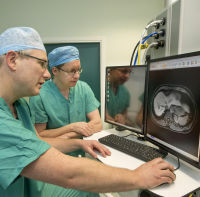 According to researchers, the new LiverMultiScan will provide advanced imagery and can help doctors have a clearer picture of the organ, tumours or inflammation before carrying out surgery. HepaT1ca - an NHS Foundation project by the University of Edinburgh and Hampshire Hospitals - created the technology, which act as detailed MRI scans and cost £1.1 million to develop. Lead researcher Damian Mole, who is based at the University, said: "We believe that these techniques can measure liver health prior to surgery and therefore contribute to a more accurate assessment of surgical risk. "Ultimately, we hope this enabling technology will significantly improve the safety of patients who undergo surgery." Each year in the UK around 1,600 operations are carried out in the treatment of liver tumours. When removing cancerous cells from the liver, the surgeon needs to leave the liver intact so that it can continue to function and keep the patient alive. The new system will give a clearer picture of the liver and the body, which should help prevent any surgical complications that arise from previously undetected health conditions, such as excessive fat, scar tissue or high iron content. Surgery is deemed to be the most effective liver cancer treatment on offer. Anyone suffering from liver cancer can take out medical travel insurance for added peace of mind. Poor liver health, including the effects of chronic liver disease, has been identified in previous research to be a key contributor to post-operation liver failure. Myrddin Rees, of Hampshire Hospitals NHS Foundation Trust, said: "The opportunity to extend surgery to more patients with primary and secondary tumours is thwarted by our inability to accurately quantify the function of the remaining liver. "This is an exciting opportunity to fill this gap in our knowledge."